This year, we are making our commencement celebrations truly spectacular as we mark our 45th year and recognize the amazing accomplishments of our graduates with celebrations in Sacramento and San Diego! 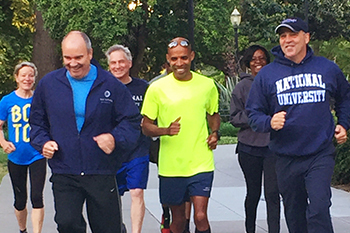 Dr. Michael R. Cunningham, Chancellor of the National University System, runs in Capitol Park with marathon legend Meb Keflezighi and members of our National University System Board of Trustees and Administrators. On May 1, over 5,000 attendees gathered in Sacramento to celebrate our Northern California graduates. Nothing brings the University greater joy than watching our students cross the stage at commencement, cheered on by their loved ones, as we celebrate their wonderful accomplishments. We kicked off the weekend with a student and alumni mixer, where faculty and staff had the opportunity to meet current alumni and new additions to our vast alumni network. These mixers are wonderful events to thank our alumni for their involvement with the University community and discuss all the ways we can provide support and opportunities for our students. During the event, we were pleased to honor Teachers Excellence Fund recipients and we had a visit from Assemblyman Ken Cooley, who stopped by to congratulate our graduates. Chancellor Cunningham pictured with Chair of the Board of Trustees, Mr. Gerald Czarnecki and Board of Trustee Emeritus recipient, Ms. Jean Leonard. Not only was Meb’s speech inspiring, but we also honored our Board of Trustee Emeritus recipient, Ms. Jean Leonard. 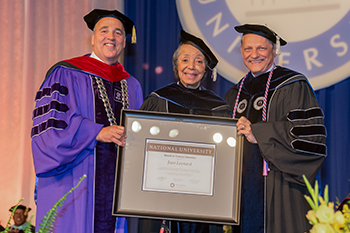 Jean has made a positive impact on so many lives as a pioneer in the field of education and has been a leader at National University for 20 years. I am so honored to know her and to see how her life’s purpose, as a true champion for education has made our world so much better. We are gearing up for Southern California’s commencement ceremony, which will take place on June 11 at San Diego’s Petco Park, home of the San Diego Padres and the 2016 Major League Baseball All-Star Game. We are excited to welcome thousands of graduates and their families as we continue to honor the hard work of our upcoming graduates!